Glazed Orange Marmalade Chicken is a tasty baked chicken dish that only takes about 5 minutes to be oven-ready. 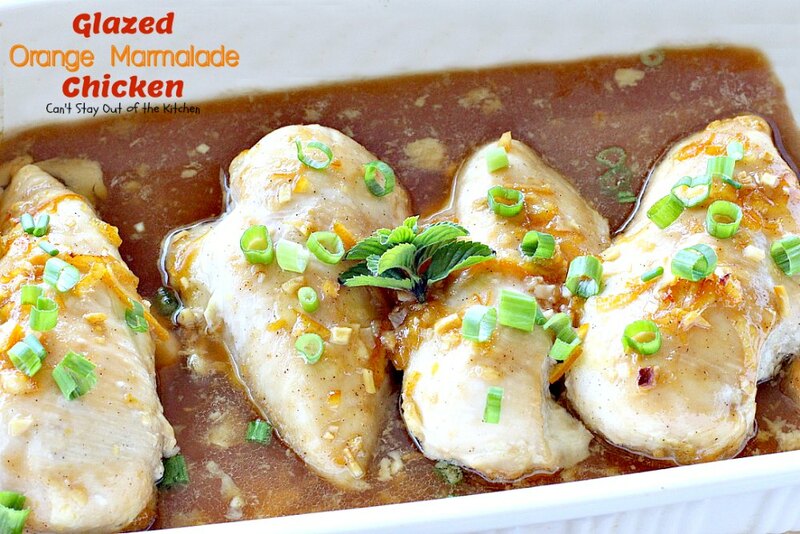 This one uses orange marmalade, orange juice, fresh ginger, garlic, honey and soy sauce for a sweet and slightly spicy essence that’s basted over the chicken. 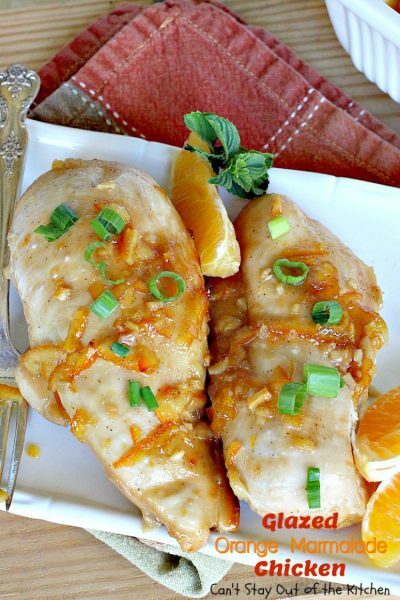 The refreshing orange sauce is then drizzled over the baked chicken and topped with green onions for a tasty main dish entree you’re sure to enjoy. I made the glaze rather thin by adding orange juice. But if you prefer a stickier, thicker sauce, then simply omit the orange juice when mixing the sauce ingredients. 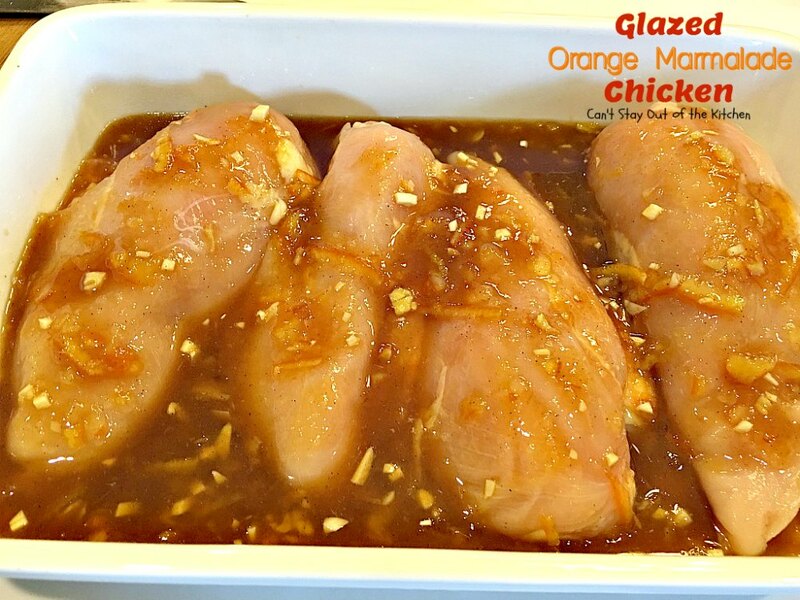 It’s also good to keep basting the chicken every ten minutes or so during baking time if you’re able, so the chicken will absorb more delicious orange-y flavor. 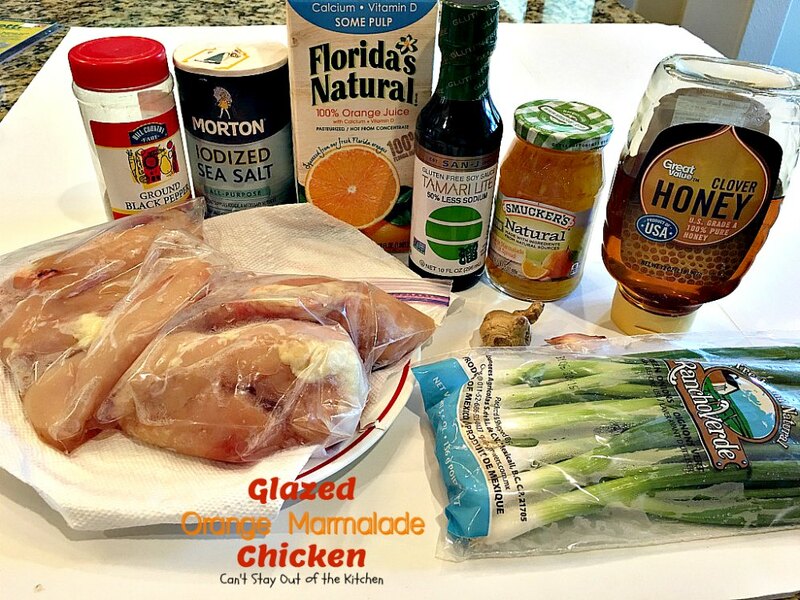 Orange Marmalade Chicken is a quick and easy sweet and spicy chicken dish. 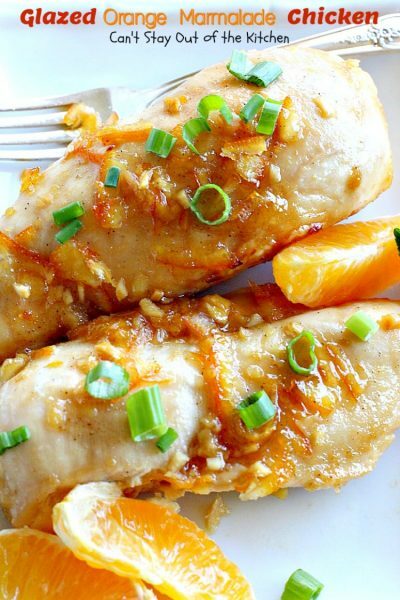 Orange Marmalade and fresh ginger provide a sweet and spicy contrast in flavors. I served Glazed Orange Marmalade Chicken with Zoodles Parmesan. Both were excellent. Grease a 9×13″ baking dish. 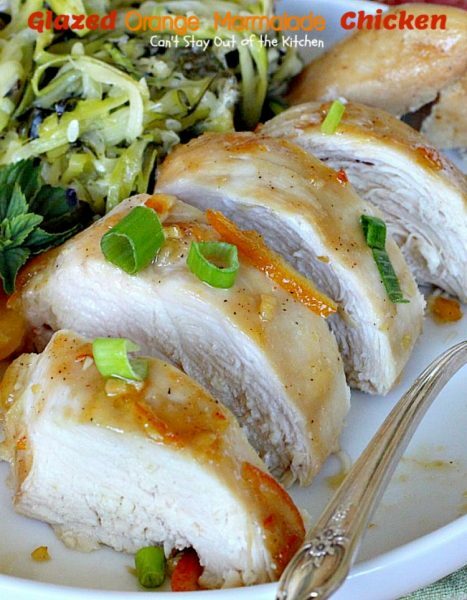 Add boneless, skinless chicken breasts. Place sauce ingredients into a mixing bowl. Stir to combine. 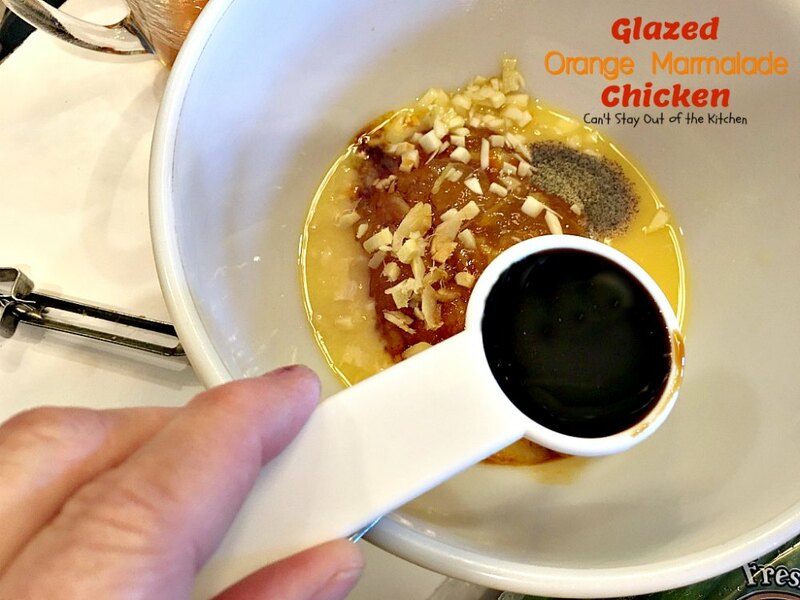 If you want a thicker sauce, omit the orange juice. Bake about 1 hour at 350. After 30 minutes turn chicken over. Baste with Orange Marmalade sauce about every 10 minutes. Garnish chicken with diced green onions and slice down to serve. Quick and easy chicken entree that uses Orange Marmalade, soy sauce and fresh ginger. After garnishing with green onions this recipe has a sweet and spicy taste that's marvelous. Gluten free. Place chicken in bottom of pan. 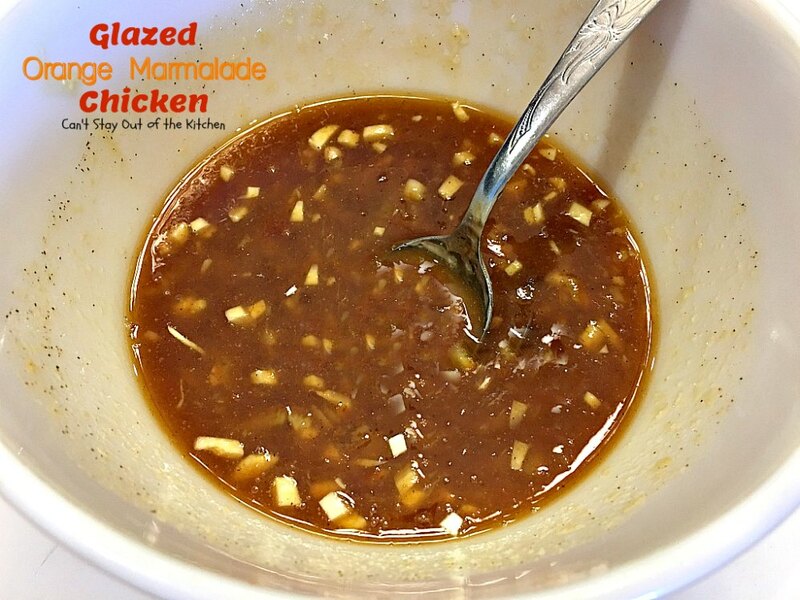 Combine marmalade, orange juice, honey, soy sauce, garlic, ginger, salt and pepper in a mixing bowl. Pour over top of chicken. Turn chicken over once during baking time. Baste with sauce about every 10 minutes. 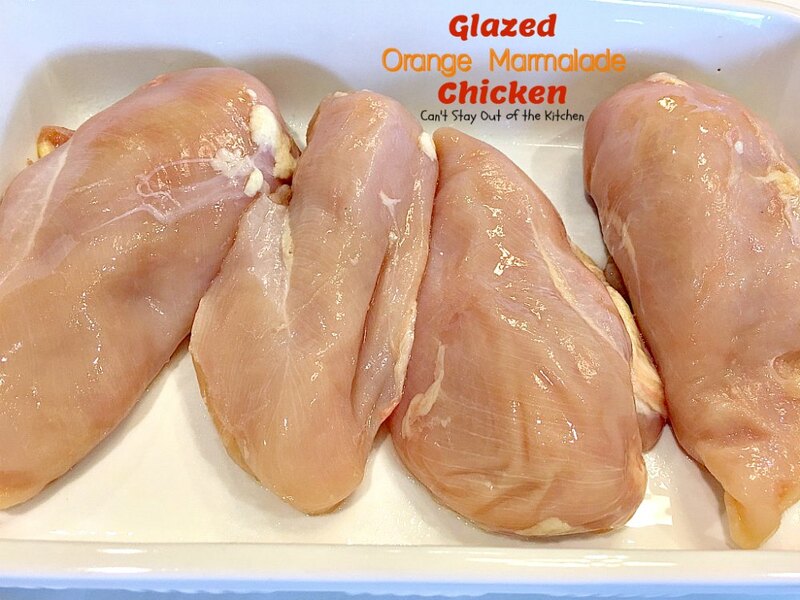 Quick and easy chicken entree that uses [url href=”http://www.smuckers.com/(S(0abcft45dvhejmmcf21d3245))/products/fruit-spreads/preserves/sweet-orange-marmalade-24″ target=”_blank”]Orange Marmalade[/url], [url href=”http://san-j.com/products/tamari-gluten-free-reduced-sodium-soy-sauce” target=”_blank”]soy sauce[/url] and fresh ginger. 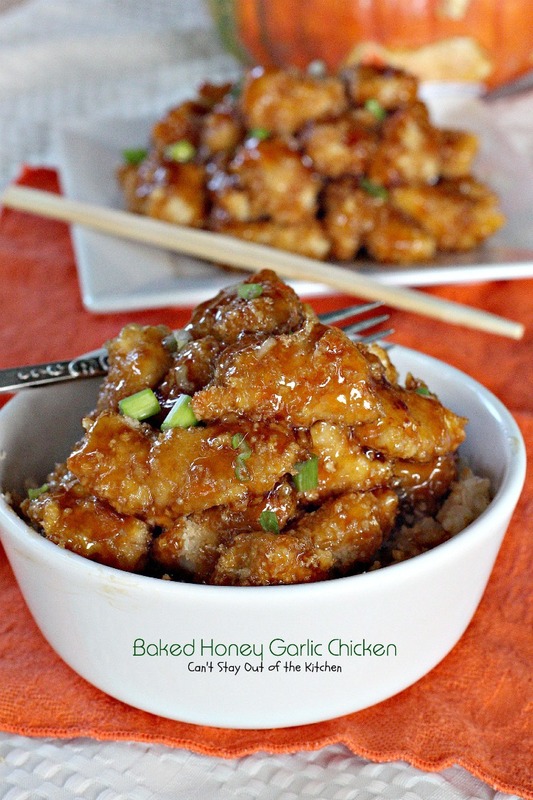 After garnishing with green onions this recipe has a sweet and spicy taste that’s marvelous. Gluten free. 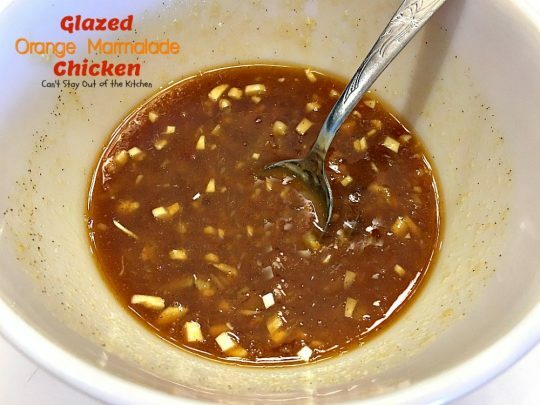 This makes more of a glaze rather than a sauce. If you want the sauce thicker, eliminate the orange juice. 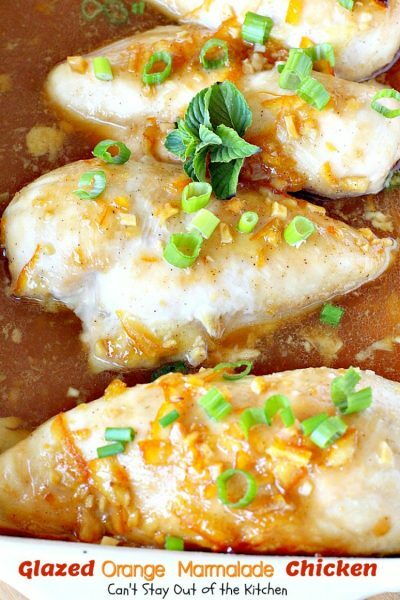 This delicious entree is so quick and easy. You can have it oven-ready in about 5 minutes. 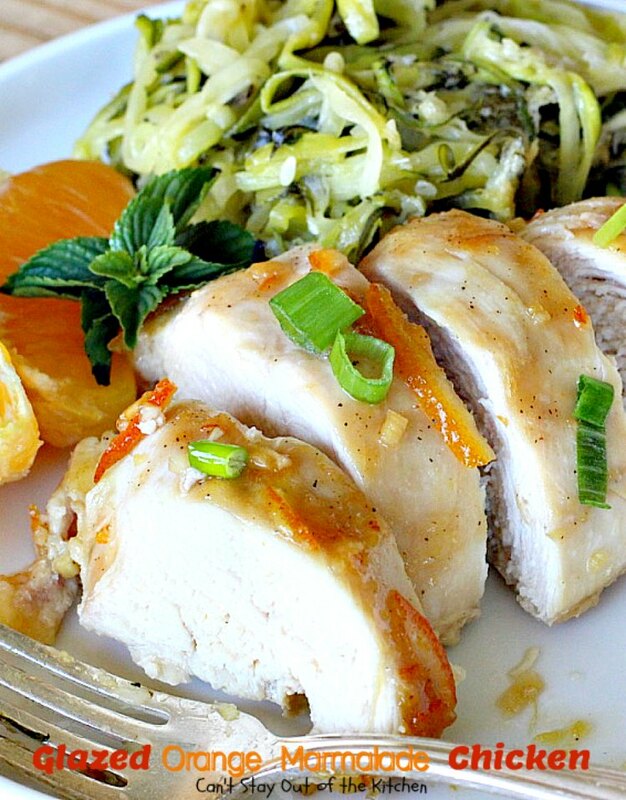 If you enjoy the taste of orange and chicken together, you’ll find this recipe delightful. 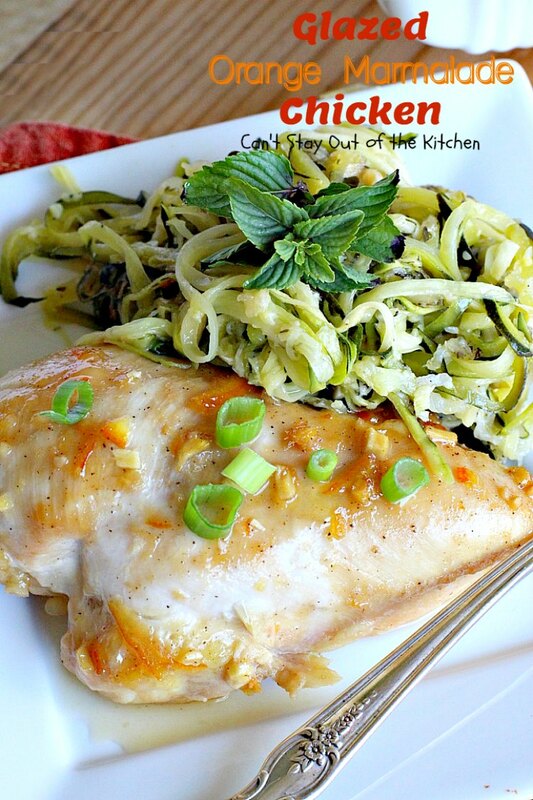 I served Glazed Orange Marmalade Chicken with Zoodles Parmesan.